They begin young learning how to do victory dances. I was watching Lucas trying to hit a golf ball on Easter Sunday--he was concentrating and focused. He was attempting to hit a golf ball with a club too large for him and he was doing a good job. 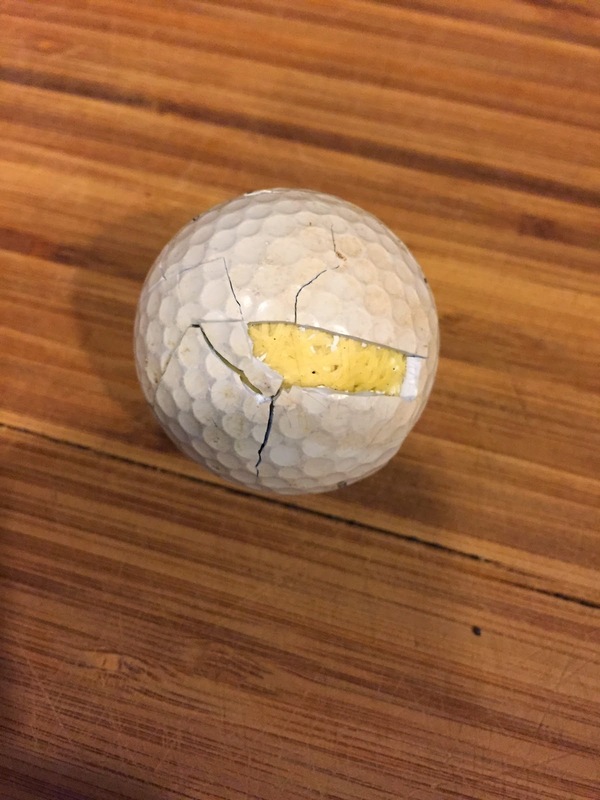 I have been hitting a few golf balls lately, and I now know how to tell when a golf ball has reached the end of its useful life. The cover comes off. I didn't know that until I began hitting golf balls repeatedly into my practice net. I've had two golf balls suffer complete failures like this. It is kind of fun to have a golf ball fail like this--it means that I got my money's worth out of the ball--and I bought these as range balls so I didn't pay much for them. But, back to Lucas--I watched him until he finally got a good hit on a golf ball and almost missed the victory dance. Watch the video until the end to see the victory dance. I need to learn those moves because I know how he feels when I make a good shot.